Dunsmuir Community Park (sometimes referred to as Centennial Park) is located in the small community of Dunsmuir, near Qualicum Bay in Electoral Area H.
The park property is 2.0 hectares (5 acres) in size. It has an older tennis court and a small half-court sport court and the remaining 4.3 acres is forested. Local volunteers built the tennis courts in 1971 for the 1971 BC Centennial Celebration and the sport court was also built by volunteers in 1999. Phase 1 - New sports court with perimeter fencing (basketball, pickleball, ball hockey, etc. ), new driveway access, off-street parking lot, and entrance sign. 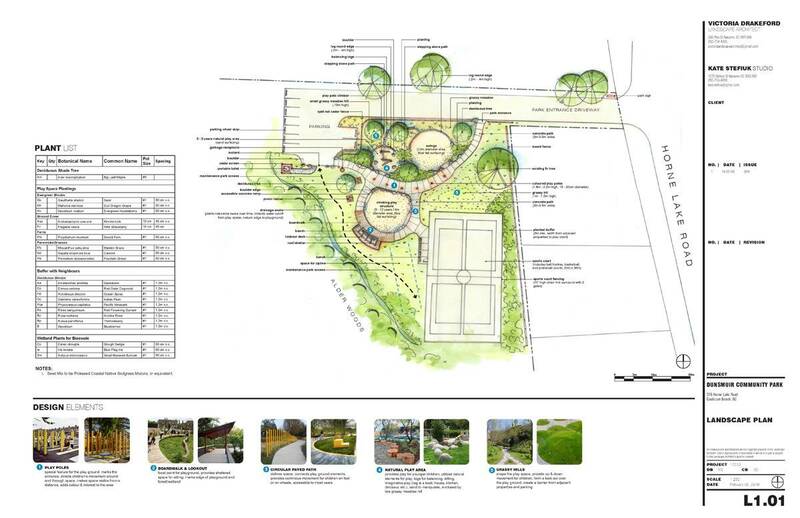 Phase 2 - Playground (2-5 and 5-12 age groups), swings, concrete paths, porta potty with surround, plantings, shade structure, picnic tables, and benches. Phase 1 park development is planned for 2018 with Phase 2 to follow when funds are available.